This is the best possible $1500 gaming pc build brought up to date for February 2019. The $1500 gaming pc build is for those wanting to game on the highest of resolutions and expect high-end gameplay. The $1500 gaming pc is best capable of resolutions of 2K with high FPS gameplay and into 4K smoothly. This build is on the very high-end of gaming, and also offers the potential for more upgrades for now or in the future. Newb Computer Build does gaming pc build updates every single month. Subscribe to our e-mail lsit to keep up to date. The $1500 gaming pc build still offers the solid power of the Ryzen 7 2700K CPU and is paired with the very new RTX 2070 graphics card. This build should rock the socks off pc games at resolutions of 2K into 4K. The RTX 2070 came out approximately 2 months ago and is quite affordable for a high-end graphics card outperforming a GTX 1080 (a previously high-performing graphics card in this range). If you want to get even more performance out of this build, then we have also included upgrades to an Intel i7 9700K cpu, or even an RTX 2080 – check out the hardware alternatives for this build below. Need more cooling? See the hardware alternatives table below. 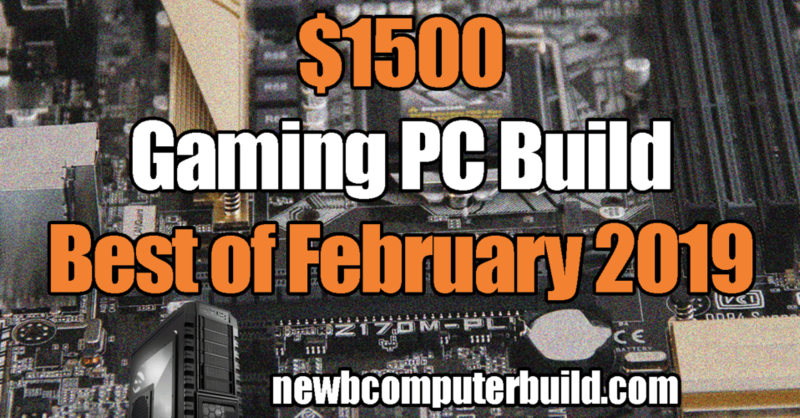 February 2019 Update: If you are in store for the best possible $1500 gaming pc, then this is it for February 2019. This build offers the solid power of the Ryzen 7 2700K CPU and is paired with the very new and veyr powerful RTX 2070 graphics card. This build performs really well at 2K into 4K resolutions. The RTX 2070 came out not long ago and is quite affordable for a high-end graphics card outperforming the previous GTX 1080 GPU. If you want to get even more performance out of this build, then we have also included upgrades to an Intel i7 9700K cpu, or even an RTX 2080 – check out the hardware alternatives for this build below. 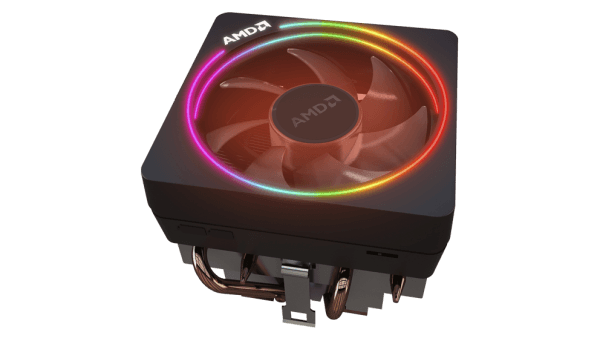 For the gaming processor this February, we have the AMD Ryzen 7 2700X CPU, which comes with eight cores and 16 threads and comes with a decent Wraith Prism (with RGB lights) CPU cooler. If you want to upgrade to a higher performing cooler, perhaps something like a higher-performing liquid CPU cooler, and you have more funds to do so, then check out the hardware alternatives. The graphics card used is an RTX 2070 (an MSI Armor 8G RTX 2070). This card far outperforms a GTX 1080, which you can still purchase and is still a great card (so if you can find one cheaper you can still get yourself one and save a few bucks). The RTX 2070 utilizes GDDR6 memory, which is the new generation of memory and it does have a faster memory speed than either a GTX 1080 or 1080 Ti in some cases. Included in the best $1500high-end build is 16GB total in memory, a kit of two 8GB Corsair Vengeance LPX DDR4 3000MHz RAM — which is plenty for this build and you always have the capacity to add more if need be in the future. The storage included in the best $1500 gaming pc build is a 1TB Western Digital Blue 3D Nand SSD, which is a high performing, high capacity SSD. The Western Digital has sequential read speeds up to 560MB/s and sequential write speeds up to 530MB/s. The Included power supply this month is the EVGA SuperNOVA 750 P2 80+ Platinum power supply. This is a highly efficient platinum rated PSU that is fully modular, making this a clutter-free PSU. 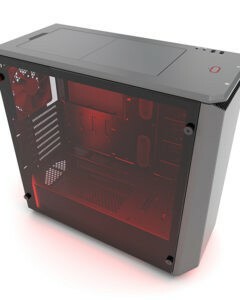 The case chosen this month is the Phantek Eclipse P400S – the one featured is the glacier white version, but it also comes as special edition red, or black, or grey. The Eclipse is clean and includes ambient RGB lighting and has a solid metal exterior and has sound dampening panels with a 3-speed fan controller. Learn more at phanetks.com. Want an Intel Build instead? The hardware upgrades you see above are recommendations for the best February 2019 gaming PC builds $1500 build. The above hardware is for those who have a little more to spend or are wanting ideas of what to upgrade to in the future. Looking for a higher-performing Intel pc build? If you want a higher-performing cpu that will take you a bit further in pc games (in terms of frame rate performance), then you could consider upgrading to an Intel i7 9700K cpu. If you do want to go down this route, then you will also have to add in a CPU cooler and a compatible motherboard (such as those included in the table above). If you are going to be serious about 4K resolution gaming, then you should seriously consider an RTX 2080 or 2080ti graphics card, such as the above Zotac GeForce RTX 2080. This may also be helpful with higher refresh rate monitors as well. The above pc build does include a Solid State Drive (SSD), which is perfectly suited for most gamers and pc builders, but if someone were searching for the fastest and one of the most efficient methods of storage, you could consider a premium PCIe Solid State Drive, such as the Samsung 970 Pro 1TB — one of the best PCIe solutions out there. If you want more than the included air CPU cooler included in the main build, the above is the Corsair Hydro Series H100i liquid CPU cooler. This cooler would be a substitute for the stock AMD Wraith Prism CPU cooler, should you feel you need it. Sweet build! Going to be building really soon.